Blue Bell/Pottstown, PA —Lateefah Simon, a nationally recognized advocate for civil rights and racial justice, will discuss how solutions to big problems often begin with one person who is willing to act when she visits Montgomery County Community College on Tuesday, March 28, at 12:30 p.m. for the annual Richard K. Bennett Distinguished Lectureship for Peace and Social Justice. The lecture will be held in the Science Center Theater, 340 DeKalb Pike, Blue Bell, with a simulcast to MCCC’s South Hall Community Room, West Campus, 101 College Drive, Pottstown. The community is invited to attend this free presentation, but tickets are required. To reserve seats, visit www.mc3.edu/BennettLecture or call 215-641-6518. Simon has more than 20 years of executive experience advancing opportunities for communities of color and low-income communities. She gives hope to thousands of families who are struggling to overcome the challenges of poverty and discrimination. She currently serves as president of the Akonadi Foundation, a charitable group that funds community projects in the San Francisco Bay area. She has received several honors for her work including being the youngest woman ever to be named a MacArthur “Genius” Grant Fellow. She also was included on the first ever Power List in O Magazine, received the Remarkable Woman Award from Lifetime TV, and was honored by JFK Presidential Library with a Fenn Award. This presentation is part of the ongoing Richard K. Bennett Distinguished Lectureship for Peace and Social Justice series which was established at the College in 1981. The lectureship reflects the ideals of Richard Bennett, a Quaker who devoted his life work to accomplishing peace and justice through non-violent efforts. 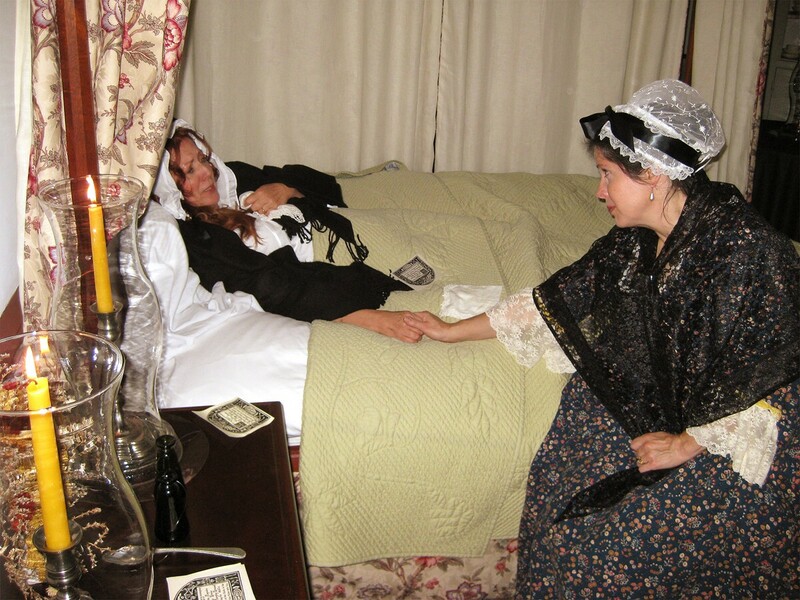 Pottstown, PA – Visit historic Pottsgrove Manor on Saturday, March 4, 2016 at 1:00pm for a historical lecture to open the site’s new exhibit, “Rise and Shine at the Manor,” which is set to run through November 5th. At 1:00pm, visitors will have a chance to meet founding father Benjamin Franklin, as portrayed by Bill Ochester. Learn about Franklin’s contributions to everyday life, including the idea of Daylight Savings time! After the lecture, visitors can take a guided tour of Pottsgrove Manor and the new exhibit. As the first rays of the morning’s sun streamed through the windows of Pottsgrove Manor, the house would already be busy with a myriad of early morning household tasks and the rituals of starting another day. See how the humble activities of daily life differed from- or were often remarkably similar to- the activities we are familiar with today. 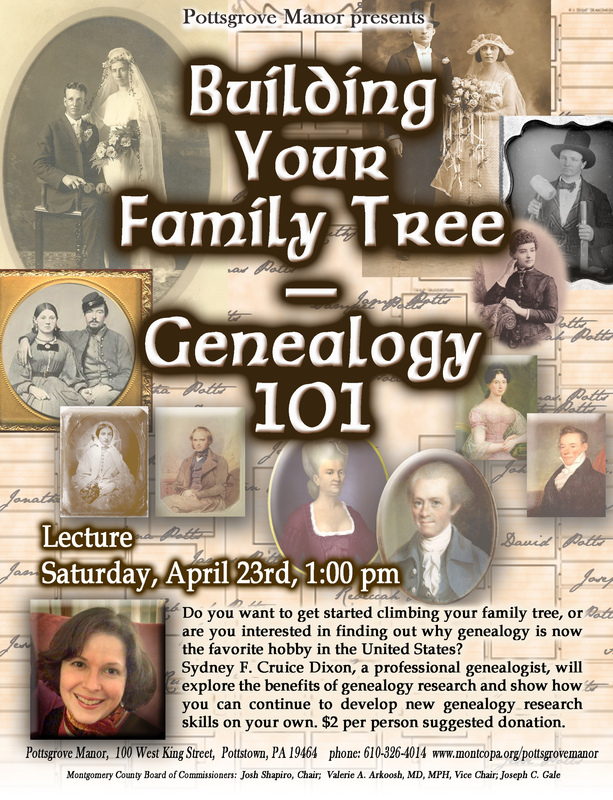 There is a suggested donation of $2.00 per person for the lecture and tour. Visitors can also take a guided tour of Pottsgrove Manor and the “Rise and Shine at the Manor” exhibit during regular museum hours: Tuesday to Saturday from 10:00am to 4:00pm and Sunday from 1:00pm to 4:00pm. Tours begin on the hour. The last tour of the day begins at 3:00pm. Pottsgrove Manor is located at 100 West King Street near the intersection of King Street and Route 100, just off Route 422, in Pottstown, Pennsylvania. Pottsgrove Manor is operated by Montgomery County under the direction of the Parks, Trails, and Historic Sites Division of the Assets and Infrastructure Department. For more information, please call 610-326-4014, or visit the website at www.montcopa.org/pottsgrovemanor. Like Pottsgrove Manor on Facebook at www.facebook.com/pottsgrovemanor. 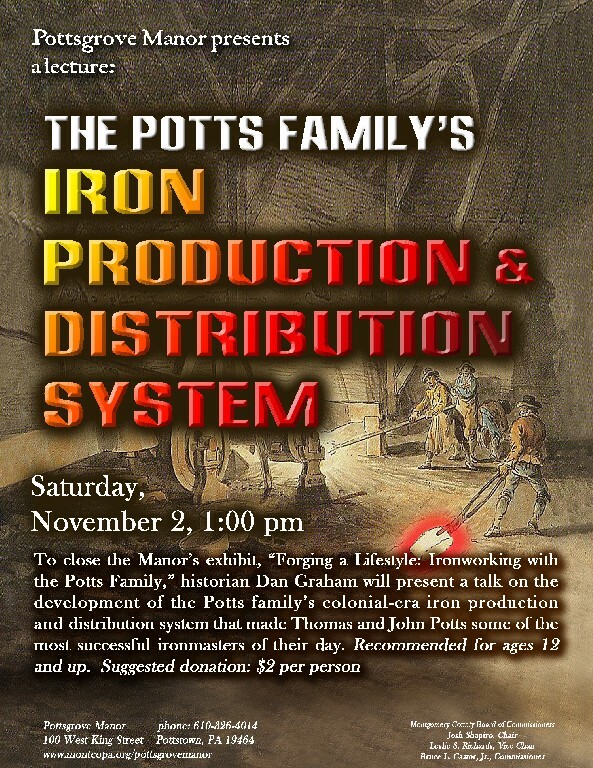 An expert on the early Pennsylvania iron industry and a genaeoligist of the Potts and Rutter families, speaker Dan Graham has done extensive research into the development of the region. In this program, Graham will talk about Pottstown’s founder, John Potts, his descendants, and the impact they had on the shaping of early Pottstown and the surrounding areas. The talk serves as the closing event for the site’s current exhibit, “Pride of Place: The Local Legacy of the Potts Family,” which runs through November 8th. The exhibit can be viewed on a guided tour of the manor house during regular museum hours: Tuesday to Saturday from 10:00am to 4:00pm and Sunday from 1:00pm to 4:00pm. Tours are given on the hour. The last tour of the day begins at 3:00pm. The site is closed Mondays and major holidays. Groups of ten or more should preregister by calling 610-326-4014. Pottsgrove Manor is located at 100 West King Street near the intersection of King Street and Route 100, just off Route 422, in Pottstown, Pennsylvania. Pottsgrove Manor is operated by Montgomery County under the direction of the Parks, Trails, and Historic Sites Division of the Assets and Infrastructure Department. For more information, please call 610-326-4014, or visit the website at www.montcopa.org/pottsgrovemanor. Like Pottsgrove Manor on Facebook at http://www.facebook.com/pottsgrovemanor. Theobald is a Virginia-based author and historian who holds a BA and MA in history from the College of William and Mary and taught American history and museum studies at Virginia Commonwealth University for thirteen years. The author of numerous magazine articles, ten nonfiction books, a mystery series, and four podcasts, Theobald also runs the “History Myths Debunked” blog. In her lecture at Pottsgrove Manor, Theobald will speak about common American history myths, including several pertaining to the clothing worn by Americans’ ancestors. Theobald will also be signing copies of her book, “Death by Petticoat,” which will be for sale at the site. The 12:00pm session will be a repeat of the 10:00am session. Seating for each session is limited. Please call the site at 610-326-4014 to make reservations. There is a $2.00 per person suggested donation for this event. 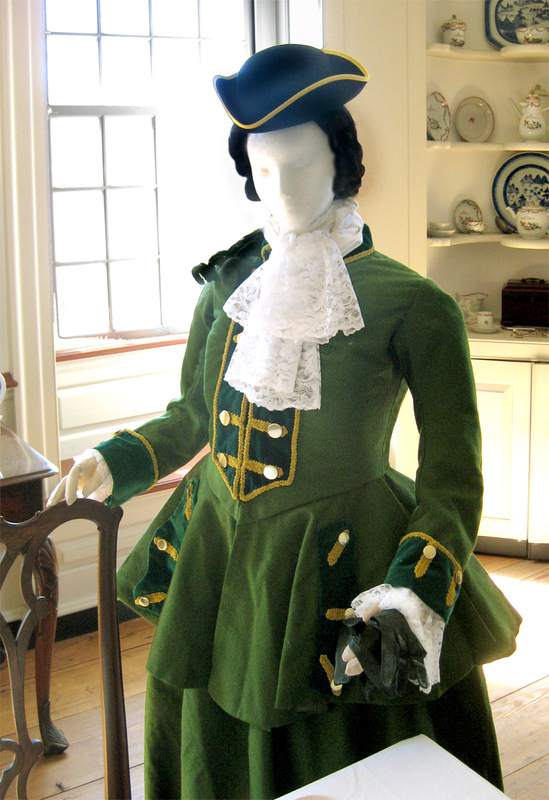 This program kicks off a new exhibit at Pottsgrove Manor, entitled, “To the Manor Worn: Clothing the Eighteenth-Century Household.” To modern sensibilities, the clothing people wore in the past can seem strange, uncomfortable, or even unhealthy. This exhibit will give visitors a better understanding of clothing and fashion in colonial America, through displays of reproduction clothing as well as a number of original pieces, including items on loan from the collections of Cliveden, Stenton, Wyck House, the Landis Valley Museum, and the Chester County Historical Society. Not only will the exhibit showcase mid-eighteenth century fashion, it will also place what people wore in a broader historical context. How were clothes made, and who made them? What materials were used, and where did they come from? Who wore what, and why? The exhibit will be open through November 2, 2014 and can be viewed on a guided tour of Pottsgrove Manor during regular museum hours. Pottsgrove Manor is located at 100 West King Street near the intersection of King Street and Route 100, just off Route 422, in Pottstown, Pennsylvania. Pottsgrove Manor is operated by Montgomery County under the direction of the Parks, Trails, and Historic Sites Division of the Assets and Infrastructure Department. Regular museum hours are Tuesday to Saturday from 10:00am to 4:00pm and Sunday from 1:00pm to 4:00pm. Tours are given on the hour. The last tour of the day begins at 3:00pm. The site is closed Mondays and holidays. Groups of ten or more should preregister by calling 610-326-4014. For more information, please call 610-326-4014, or visit the website at www.montcopa.org/pottsgrovemanor. Like Pottsgrove Manor on Facebook at http://www.facebook.com/pottsgrovemanor. 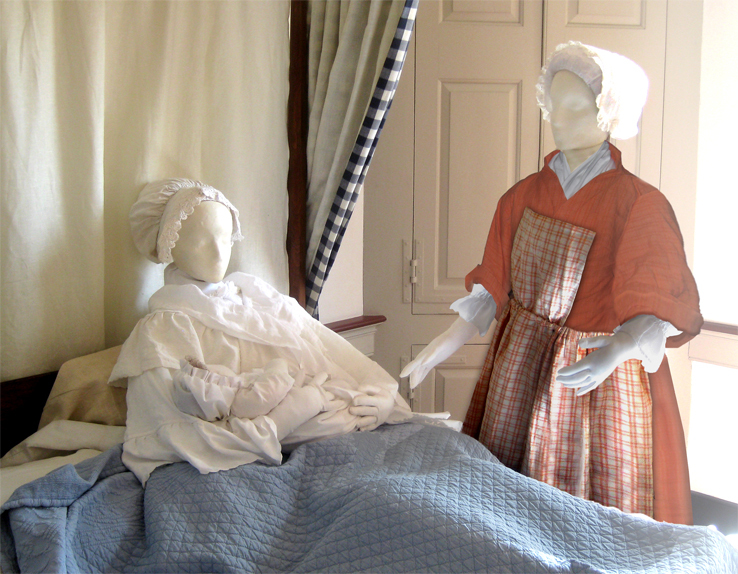 Ruth Potts, the lady of the house at colonial Pottsgrove Manor, managed to birth thirteen children and outlive her husband by almost two decades, but not all colonial women were so fortunate. In the lecture, Webster will speak about the difficulties faced by women in 18th-century America. A donation of $2 per person is suggested for this program. This lecture is being held in conjunction with the museum’s current exhibit, “Matters Personal, Details Private: Cleanliness, Hygiene, and Personal Pursuits in the Colonial Home.” After the presentation, a guided tour of the manor house and the exhibit will be offered. This will be one of the last opportunities for the public to tour the “Matters Personal, Details Private” exhibit before it ends on November 4th. Pottsgrove Manor, home of John Potts, colonial ironmaster and founder of Pottstown, is located at 100 West King Street near the intersection of King Street and Route 100, just off Route 422, in Pottstown, Pennsylvania. Pottsgrove Manor is operated by MontgomeryCounty under the direction of the of the Assets & Infrastructure Department. Regular museum hours: Tuesday to Saturday, 10:00 a.m. to 4:00 p.m. & Sunday, 1:00 to 4:00 p.m. Tours are given on the hour; last tour of the day begins as 3:00 p.m. Groups of 10 or more should pre-register by calling 610.326.4014. For more information and a full calendar of events, visit us on the web at http://historicsites.montcopa.org/pottsgrovemanor or http://www.facebook.com/PottsgroveManor.